Life Path 8 people come to being with characteristics that allow them to organize, lead, instruct and rule. Highly ambitious, you have goals in mind and are eager to strive forward to reach them in the quickest and most efficient manner possible. These people have incredible potential for bringing even the most grandiose schemes and ideas to light and the persistence to see the project through until the end. Executive leaders often follow Life Path 8. The quintessential Life Path 8 person is an amiable workaholic. You survey the people who you come in contact with and determine if they can be of assistance to your grand plan. Your focus is on hard work and utilizing your resources, including people, appropriately to further your goals. The understanding that you need help along the way is greatly assisted through your ability of recognizing qualities in others and inspiring them to greater thing. Many people on this path make exceptional leaders. Not only do you passionately follow your own inspired ideas until they come to fruition, but you can launch other people's careers or projects along with you. 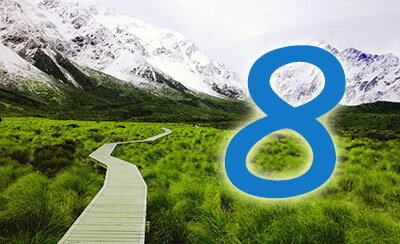 Material aspects of the world are a focus of Life Path 8 individuals. The most successful ones are some of the world's richest people. Whatever goal or plan you are working towards will usually result in great material wealth and the accompanying power. These positive traits of an individual who walks on the Life Path 8 can quickly turn to negatives if they do not maintain their positive attitude. When in the grips of work, they can occasionally act like dictators who are using others to further their own goals instead of inspiring others down their own path. The drive and dedication to projects can put people off socially as they may feel second-best to whatever grand plan is in the works. The focus on financial well-being and the quest for riches and power can get in the way of their own health and the considerations of family and friends. Life Path 8 people must guard against letting their plans become obsessions.